Hey folks! I am in the middle of moving as we speak and trying to wrap up work, billing, moving, late client payments, and a bunch of other fun stuff. Needless to say, my blogging has taken a bit of a back burner. Once I am settled in my new home - a fantastic farmhouse in East Charlotte - I plan to get back to basics and slow down a bit which should allow for more enjoyment of the Vermont music scene - especially outside of the Burlington bubble. The Mitch and I even plan on having weekly music nights in our music room and are looking to meet more musicians to join in on occasion. I think our goal is to create a Vermont farmhouse sound, not s band. Anyway, it has been brought to my attention that the big, heavy music supporters at Big Heavy World have created a survey to learn more about how Vermont musicians contribute to their society, culture, and economy. I strongly encourage you to take a few moments and provide your feedback which will help Big Heavy World better support Vermont music and musicians. Peace everyone and Happy Spring! Check it - I just sent this release to the media and all you VT music industry readers should come check this out!!! GREAT opportunity to see how you can have some involvement in this growing-in-popularity magazine and meet some good contacts in the scene! 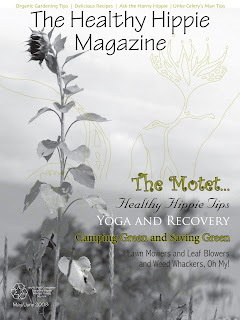 The Healthy Hippie Magazine Officially Launches May 17th! Burlington, VT – Taraleigh Silberberg, aka “The Healthy Hippie,” announces the launch of the first official issue of The Healthy Hippie Magazine. The magazine’s launch party takes place at Club Metronome on Saturday, May 17th from 5:30 – 8:30 pm and is open to the public with no cover. The Healthy Hippie Magazine is a publication that entertains while educating. It provides information on green living and building, health, and live music. The magazine strives to help readers learn to live in balance and to “live the life you love” by eating, living, and loving deliciously! The magazine was started by Silberberg after receiving accolades of positive feedback from her weekly Healthy Hippie Newsletter (distributed to approximately 1,500 subscribed readers) and a variety of other people whose lives she has deeply impacted. Silberberg is a holistic health counselor and nutritional coach certified by the Institute of Integrative Nutrition, teaches dance and movement at music festivals around the Northeast as well as in various locations throughout Greater Burlington, was a New Jersey Nets cheerleader, New York Knicks tumbler, and toured with Phish for several years (as a fan) which spawned many of the tips she provides today. A special promotional issue of The Healthy Hippie Magazine was distributed throughout Vermont and Northeast music festivals from January through March, earning the magazine insightful feedback, recognition, readers, subscribers, advertisers, and partners. The first official issue will begin distribution the first week in May and will be celebrated at the launch party on May 17th. The Club Metronome/Nectar’s sponsored event will feature music by Guagua and Dave Halchek and healthy snacks which have been featured in the magazine, newsletter, and on the website. The first 50 people who bring two non-perishable food items will receive a Vermont-inspired “Healthy Hippie” goody bag. Editors, contributors, advertisers, friends, family, and fans have all been invited to join in on the sure-to-be-lively celebration of “living the life you love.” A networking table will be provided for businesses to connect with other like minded individuals. “I am a big supporter of anyone trying to start their own business,” comments Nectar’s and Metronome co-owner, Damon Brink. “Taraleigh is obviously dedicated to her mission and her energy is evident in every interaction I have with her. I think the party is going to be a great success because she is involving her community and I will continue to support her and other local business as they grow." 1.) The Healthy Hippie - Have you heard of her yet? She publishes the Healthy Hippie Magazine and a weekly newsletter. The audience is Vermont and Northeast music festivals. Check out www.healthyhippie.net to learn ways you can promote your show! Oh, and be hip and meet lots of folks at the magazine's launch party at Nectar's, May 17from 5:30 - 8:30! 3.) WRUV and The Radiator - You can't just send blindly (not that you ever should anyway), but listen and pick a show that reaches your audience and get in touch with the DJ for that show! www.uvm.edu/~wruv/ and www.theradiator.org. 5.) 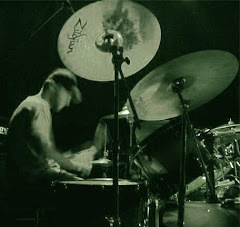 Brent Hallenbeck - Not only is he the entertainment editor at The Burlington Free Press, but he also writes an active music blog, Brent's Notebook. Good person to send info to - in advance! 6.) Dan Bolles - He may write the critically objective reviews in Seven Days, but he also edits the all important music listings as well as authors an active blog, Solid State. Looks like music coverage might be expanding as well with a few more music writers - so be in touch and once again, in advance! 7.) Weekly and Community Newspapers - If you're playing in almost any Vermont town, there is sure to be a local, weekly type of paper mailed to all residents. Such a fantastic way to promote your show, so look into it!!! 8.) Skyline Music - Run by former Burlington music fave, Pat May, the Skyline Music website - www.skylineonline.com - has a fantastic free download of 100 Free Ways to Promote Your Band. I highly recommend memorizing this document. 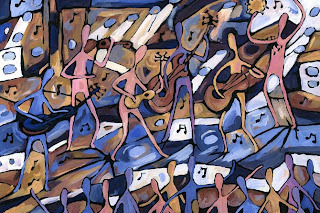 Please remember, I only write about music taking place in Vermont, by Vermont musicians! If you are both a Vermont musician and making music in Vermont - I want to know about it! Thanks everyone for so much reading and blog feedback - this is great! It seems I have a pretty diverse readership of Vermont musicians, management folks, recording studios, etc. Another words, lots of industry folk. So, bands, fear not - you will still be written about, but since my audience seems to be very "in-the-industry" I thought I'd take a post or a few and highlight some industry insiders! I mean, the music don't play without the peeps in the background, right? Halogen Media Works - www.halogenmediaworks.com - These guys are like the marketing agency of the music business. Working with a very new media driven approach, they bring together a collaboration of record labels, producers, managers, and bands for distribution, production, development, and events. It seems they even stream beyond just music as their client base is broad. They have West Coast offices, but are headquarted in Montpelier! Charles Eller Studios - www.charlesellerstudios.com - Located in beautiful yellow farmhouse in Charlotte is one of Vermont's most renowned recording studios. Charles, or as those who know him well, Chas, has been recording for 30 years and has a very impressive list of credits to his name. The studio offers analog and digital recording, remote recording, audio for video, music production, and sideman services. Home base for Vermont world music record label, Cumbancha, Charles Eller Studios offers services to everyone from musicians to companies to other business and entertainment production companies. Thrive Promotions - www.thrivepromotions.org - Ah-ha! For those bands who have contacted me as a potential publicist - check these guys out! (while I'd love to be a music publicist, my niche is with Vermont companies - I'll just write about the music for now!) Anyway, Thrive is located in Burlington and is your all-purpose artist promotion company. Going on tour in a new region or heading out nationally - get in touch with Thrive and see how they can help you out!